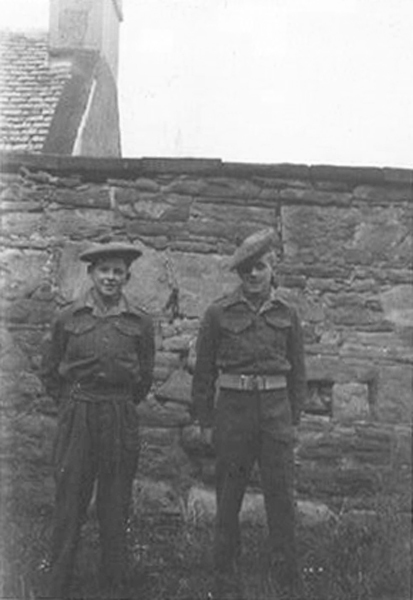 Me with Harry O'Neill, on the right, in my backyard in 1954. We were both in the army cadets. I don't remember the picture being taken but I do recall my time in the army cadets. We had an indoor firing range at the drill hall on Joss Street. I remember one individual whom I will not name here, who was terrible at rifle firing. He had an annoying habit of lowering the rifle barrel as he squeezed the trigger. This caused the bullet to ricochette off the concrete floor and find its way back towards the firing ramp, causing all there to duck. Much to our relief he was taken off target practice. I also had a dramatic experience, a pal of mine was doing a John Wayne impression with a rifle 'Hands up' sort of thing, when the officer came in and told him not to point the rifle at anyone. My friend casually replied ' It's not loaded' pointed it at the roof and pulled the trigger, with loud bang the bullet went through the roof! Are you Kathleen Macleod's brother? Hi Janet, yes I am the same person. Are you Janet (Nee) Macpherson who has a younger brother Billy, I seem to remember a post some time ago when I put two and two together. I hope you are all well. Few of the Inverg. people knew my name was Donald James Macleod so I still get a lot of confusion, albeit I have answered to a few names in my time. Nice to hear from you. Hello Sonny, good to see your photo. I used to go around with Jimmy Will and Robert Macrae. Did you live on the corner of Shore Road next to the Bonemill? Hi Billy, nice to hear from you. I remember you well, many a good laugh we all had. Fowler the shoemaker's shop was on the corner on the High Street and I lived next door in a big house which is now demolished, just directly opposite the Royal Hotel. When we were little we used to stick our heads through the wooden railing in front of the Royal, and of course got stuck and had to be rescued. I got friendly with Robert in my later teens, he stays in Evanton now. I still see his brother Richard and his sisters sometimes. Hi Sonny your comment about sticking your head in the Royal Hotel railings we used to dare each to bang the dinner gong in the hotel foyer and then move fast down the Royal Lane. Hi Billy, did you live at the bottom of King Street? Jimmy is my younger brother, he lives in Leslie, Fife. Hi Gordon, I lived at The Bungalow 2 Joss Street. I Remember your house on Shore Road, it was an upstairs house. Jimmy was in my class, Mrs Wilson was the teacher. Hi Gordon, you are correct re a Macpherson that lived at the bottom of King St. It was The Black Prince, Michael Macpherson. Hi Sonny! Glad to hear you are still alive and kicking! The NAAFI Nissan huts used to be broken into in the winter for roller skating activities. I think the huts had fallen out of use so no harm done. The area around the huts (in Joss Street) were a major play area for kids of all ages in the early 1950s. On winter evenings, despite the dark and cold, scores of kids would be out there playing "Kick the Can" and other games. No wonder so many of our generations live to good ages, we had the benefit of healthy active childhoods...outdoors and the benefits of the early NHS which ensured that even the poor received proper nourishment and vitamins. Hi Sonny, remember you more than well. I was from Alness. I recall you were an excellent swimmer and won most races. I was not too bad myself but you were always ahead of me. Also remember the "Greasy Pole" at Galas. This was at the old sea pool on the road to Saltburn and I could always look forward to a dry off and a mug of Bovril.